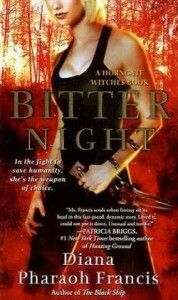 Diana Pharaoh Francis introduces us to the Horngate Witches series with an intriguing book one. She sets the bar high with non stop action fueled by a variety of characters and personalities. Bitter Night brings you along for the ride into Max’s world. She is a Shadowblade, yet a very unconventional one. She is stronger than she or anyone knows, which will come in handy if the end of the book is any indication of how the rest of the series will go...with her constantly in trouble. A few hiccups with the writing. But overall a very entertaining urban fantasy. It will be fun to see where Francis takes us with the series.